On February 2 1888 the newly-founded Brooklyn Surgical Society held one of its regular meetings in New York. Local surgeons presented new research and reported on their recent surgical experience. But the most memorable event of the evening was a presentation by Dr George Fowler, a surgeon at St Mary’s Hospital. He began by asking one of his patients to join him on the stage, a fit and healthy-looking thirty-year old. This man, he explained to his distinguished audience, was a living curiosity. For he had not one, but two, pistol bullets lodged deep inside his brain. This man, aged 30, entered St. Mary’s Hospital on the 13th of May, with a gunshot wound of the head. The pistol was fired at short range, the muzzle almost touching his forehead. 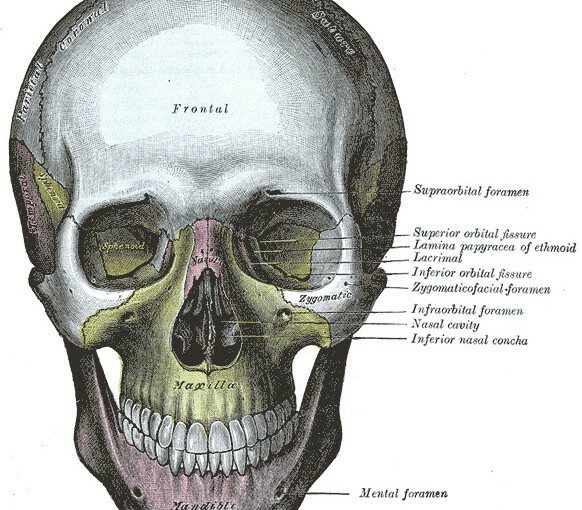 The first bullet entered the frontal bone a little to the left of the median line; the second entered at the inner canthus of the right eye, tearing away the lower and posterior portion of the frontal sinus of that side. He was unconscious when he came into the hospital. Not entirely surprising. The inner canthus is the corner of the eye nearest the nose. It sounds a very nasty injury. After making a crucial incision and laying bare the bone, it was found that a compound fracture of the frontal bone had been sustained, the bullet having passed directly downward, perforating the dura and being lost in the cerebrum. Deep inside the brain, in other words. The bullet was from a .32 calibre revolver and the opening in the dura was about the size of my little finger. Some portion of the frontal bone which was driven into the brain was removed with the forceps and was found to be stained with the lead of the bullet. The .32 calibre was commonly used in handguns in the late nineteenth century. These weapons typically had a short range and were often miniature pistols or revolvers which could easily be concealed in the clothing for personal protection. It was difficult to trace the course of the second bullet, but the posterior wall of the right frontal sinus was entirely destroyed and portions of that were also taken out from the cerebrum; a portion of brain matter escaped – the portion of the frontal lobe resting on the roof of the orbit of this side was destroyed – there was a considerable laceration of the brain at this point. Injuries to the frontal lobe of the brain can often be survived if they are not too extensive, but the prognosis for this patient was not good, given that two bullets were lodged in different parts of the organ. Nevertheless, the surgeon decided to attempt further exploration. After removing the debris I tried to locate the balls by drawing an imaginary line across as nearly as possible in a line with the pistol and trephining posteriorally at a point where that line would meet. A trephine is a surgical instrument used to remove a circle of bone. The operation of trephination has been used since antiquity to relieve pressure on the brain following skull fracture and related injuries. After trephining the occipital bone a slender needle was passed into the brain substance, making the needle pass systematically in lines radiating from this latter opening as a central point to all portions of the brain, as nearly as could be reached, but no trace of the bullet could be discovered, the openings were then closed. This sounds a dangerous undertaking, but the surgeon seems to caused no major damage additional to what had already occurred. In front, after removing the debris, about a dozen strands of catgut were passed into the wound coming through the frontal bone or rather through the tissues covering the frontal bone, and half a dozen strands of catgut were also passed down through what remained of the frontal sinus to afford an escape at this point. The point of this procedure was to provide a passage for drainage. The surgeon concluded his intervention by irrigating the nasal cavity with antiseptic and stuffing it with cotton. The patient’s after history was entirely uneventful; he never even complained of a headache. He was up and about, assisting in the wards of the hospital as a ward orderly, in three weeks, and left the hospital on the 7th of June, fully healed and in possession of all his faculties. A pretty amazing recovery; but not entirely without complication. About the 5th of last September he noticed some discharge where the upper opening had been, and upon exploration we found necrosed bone, which could be discovered from both openings. The parts were reopened, a small portion of the bone was removed from the lower opening, and it was thought that that would end the trouble. But it did not, and about four weeks afterwards he again appeared with the upper opening still discharging pus. The surgeon decided on one final exploration of the wound, which revealed a portion of dead bone – a ‘sequestrum’ in surgical jargon – about three-eighths of an inch long. There was also found lying at that point a strong fibrous partition between the fragments of bone and the cavity of the skull beyond, showing that nature had walled out, as it were, this portion of necrotic bone and left it lying there loosely. It was removed, catgut drains were placed in position and the patient made a rapid and complete recovery. He suffers from nothing except perhaps a little mental depression which may or may not be the result of the original injury. Both bullets are still somewhere in the brain. Leaving the patient with nothing worse than a really cool story to tell the grandchildren. Let’s hope he stayed out of trouble for long enough to have some. I’m always amazed at the amount of damage the human brain can sustain and survive in traumatic cases like this. At the very least, I’m curious about lead poisoning in this young man’s future.